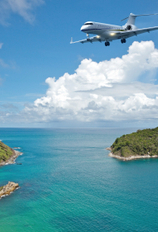 There’s no place on Earth quite like each of these 10 unbelievable destinations. So mind-boggling and surreal are the landscapes that photos barely capture a fraction of the magnitude you experience when you see them with your own eyes. Some are terrific optical illusions, others are freaks of nature, and most will have you shaking your head at what feels like a suspended reality spreading out before you. From a distance, this 655-foot cliff looks like a series of icy terraces covered in blinding white snow, but that couldn't be further from the truth. The terraces are actually hard, calcium carbonate mineral deposits filled with geothermal waters as warm as 95 degrees. Continually fed by underground springs that surface through a fault near the top and cascade down, Pamukkale's thermal pools and petrified waterfalls form a bizarre landscape that has been a therapeutic destination for millennia. 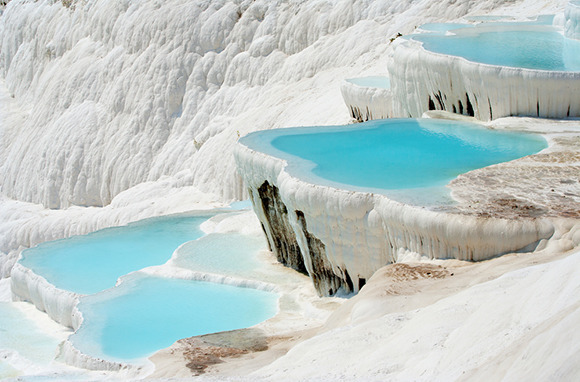 Pamukkale, which literally means "cotton castle," is where the kings of the second century B.C. established the spa town of Hierapolis. Greek monuments can still be seen at this UNESCO World Heritage site today. If You Go: Bring sunglasses. In any season, the sun's reflection off of the water and white sediments is extremely bright. Swim in the Sacred Pool among ancient fallen columns. You'll also find other ancient ruins and a five-star spa here. 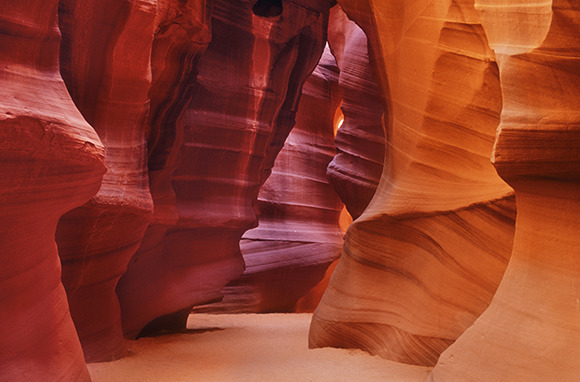 A two-and-a-half-hour drive north of the Grand Canyon near the Utah border takes you to another incredible site that photos don't quite do justice: Antelope Canyon. This slot canyon, named after the herds of pronghorn antelope that once roamed freely here, feels like another planet, with its flowing form that twists and turns into surreal passageways. You explore at ground level and weave around the undulating sandstone walls shaped by centuries of monsoon flash flooding and erosion. Beams of light shine down in bright columns, creating the most interesting dance of color, shape, and shadow. With every step and every subtle shift of the sun's position, the scene changes. If You Go: The best viewing conditions are from April to September, when the sun is high in the sky. Go midday for the most dramatic lighting, but expect crowds. The canyon is on Navajo land, and Navajo people lead guided tours (required for entering). Offshore, along the northern coast of B.C., lies an archipelago with one of the highest densities of intertidal life anywhere in the world: Haida Gwaii. More than 290 species thrive here in Burnaby Narrows, the shallow 55-yard-wide channel that separates Burnaby Island from Moresby Island. At low tide, you can paddle through calm water that's only one or two feet deep and see moon snails, hermit crabs, sea cucumbers, and bat stars clinging to rocks like a brightly colored assortment of hard candy. The intertidal zone is a true biological wonder. Every changing tide and current brings an abundant supply of dissolved oxygen and fresh nutrients to create ideal conditions for life. Seeing nearly 70 bat stars per square yard in nearly every hue of the rainbow is shocking. 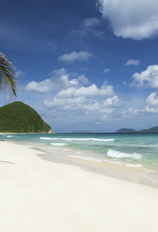 If You Go: The best time to visit is July and August, when it's usually warm and sunny. 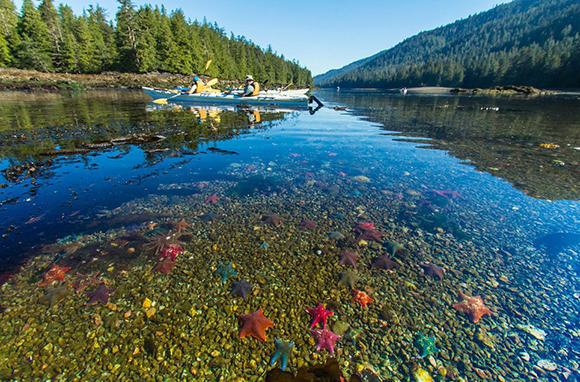 Drift through this stunning area, a protected no-walk zone, on a kayaking tour with Tofino Expeditions. Guides will introduce you to the prevalent First Nations culture here. 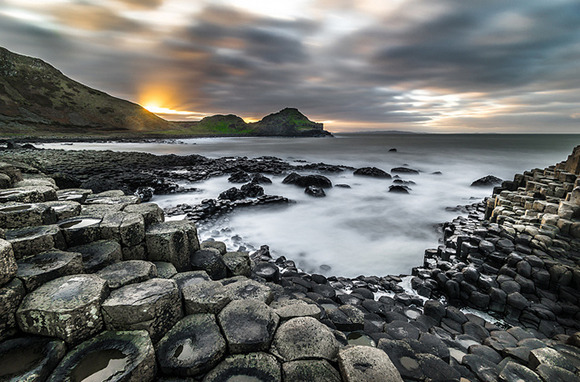 The Giant's Causeway, a string of more than 38,000 interlocking hexagonal columns on the northern coast of Ireland, is impeccably geometric. Millions of years of volcanic activity shaped this geologic wonder that rises out of the sea like a stepping-stone highway. Volcanic forces created layers of basalt that cooled and happened to crack into these curious towers, grouped in honeycomb-like clusters. As the legend goes, a giant warrior named Finn MacCool built this causeway so he could walk across the sea and face his Scottish rival, Benandonner. If You Go: Hike the causeway, a UNESCO World Heritage site, to see the Giant's Boot, the Wishing Chair, and other distinctive rock formations. Explore interactive exhibits in the visitor center, where you can pick up a handheld audio guide to use outside. 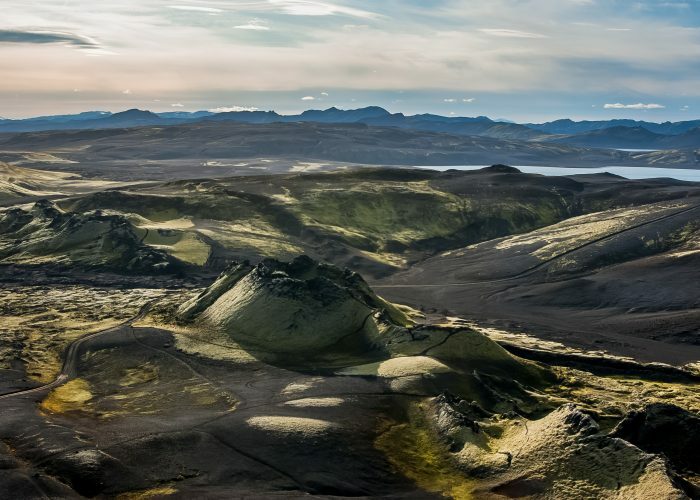 When you look out over Iceland's Laki volcanic area, it's hard to imagine that almost three and a half cubic miles of lava poured over the entire landscape 231 years ago. For miles in every direction as far as you can see, the lava fields in Vatnajökull National Park are blanketed in a thick layer of spongy green moss. It's like a strange green-hued alien wasteland, without a single tree. Since the massive eruptions in 1783 and 1784 tore open a seven-mile-long fissure here, the mosses (which can grow with virtually no roots) have taken over. Nowhere else in Iceland are mosses as prominent. If You Go: Look for fairy rings and other strange arc formations in the moss carpet. National Geographic Expeditions and other hiking tour companies take you through the middle of the craters, which can be accessed only by four-wheel drive. Driving across the Salar de Uyuni, the "salt flat of Uyuni," will mess with your mind. When covered with a thin layer of rainwater, it becomes a massive mirror, doubling everything you see. On dry days, set against a bright blue sky, it looks more like a vast glacier, which just feels wrong, considering that the average daily high temperatures are 55 to 68 degrees year-round. Cloudy days create a whiteout effect, making it nearly impossible to differentiate the earth from heaven. 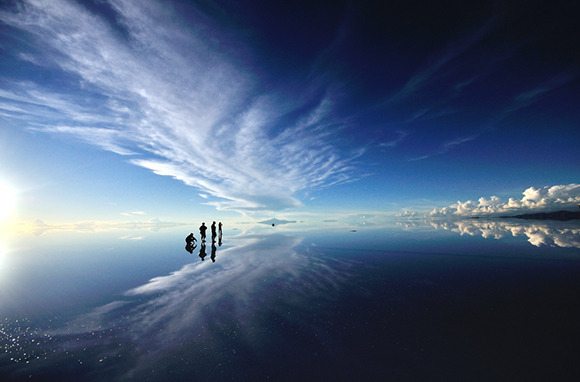 The sheer size of the world's largest salt flat, spanning a vast 4,086 square miles and with a crust up to three yards thick, is mind-boggling. If You Go: Tour guides will drive you to see giant cacti on the salt flat's "islands," the tops of ancient submerged volcanoes. You'll see breeding grounds for pink flamingos and a hotel made entirely of salt. 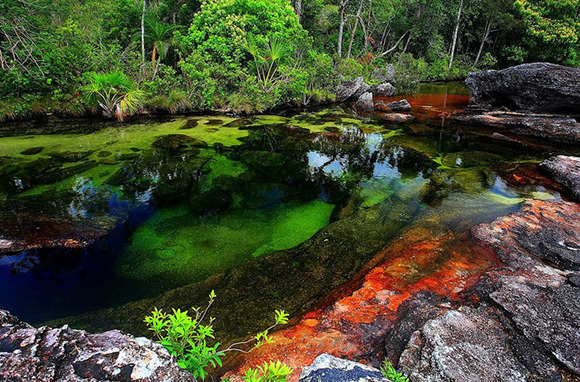 Known in Colombia as the "River of Five Colors" and the "River That Escaped Paradise," Caño Cristales is a fantastical river alive with color and movement. It's like something out of a Roald Dahl book. During certain times of the year when the algae blooms, the crystal-clear water appears to turn blood red in patches and bright pink, yellow, green, or orange in other areas. The flow of the water creates a mesmerizing undulation of color that whirls as if it were a ruffled dress. What makes the experience even more magical is the river's elusive location. Until 2009, the area was closed to locals and tourists due to armed conflict, but now it is safe and open to everyone. If You Go: The best time to see the river at its most colorful is between June and December with the peak from September to November. This is the region's dry season, when water levels drop and more sunlight reaches the algae to create the bloom. Arrange a tour from Bogota or a guide in La Macarena. Cascading some 40 acres down the slopes of the lofty Ailao Mountains to the banks of Hong River, the Honghe Hani Rice Terraces are an unbelievable agricultural feat. For more than 1,300 years, the Hani people have carved these terraces and rigged an intricate system of channels to funnel water from the mountain forests above. 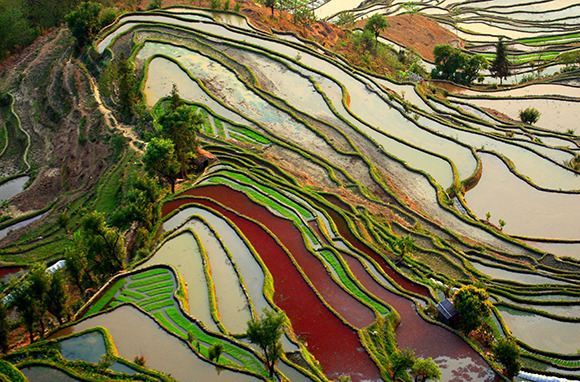 The terraces are as complex as they are visually stunning, beautifully following the sensuous contours of the mountainside. And there's no modern development around to wreck the view. This UNESCO World Heritage site includes the rice paddy workers' traditionally built homes, constructed with earth and stone or adobe bricks with straw thatched roofs. If You Go: Visit in winter, when the terraces are filled with water and the skies are generally clear. The best views occur at sunrise or sunset, when the sky's warm hues transform the terraces into a sea of gold or red. Walk or take a boat ride through Waitomo Glowworm Caves, a couple hours' drive south of Auckland, for one of the country's most enchanting experiences. 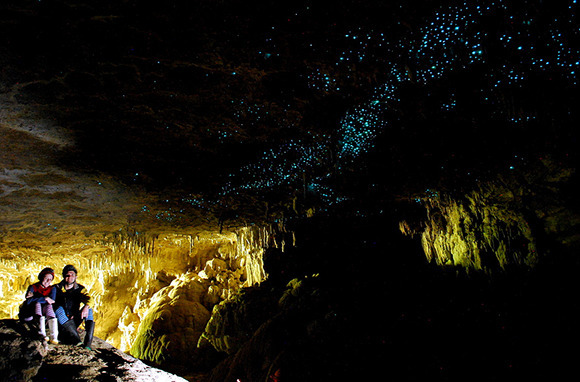 Glowworms cling to the ceiling of these caverns by the thousands, lighting up the darkness like dazzling blue-green constellations on a starry night. The sight is so startling that it often immediately silences touring crowds into a daze of fairytale-like wonder. The "worms" aren't actually worms at all but are insects that look like large mosquitos. During their larvae stage of development, the worms emit a bioluminescent glow, which gently lights up the entire cave. They're unique to New Zealand, although Australia has a related species that emits less light and tends to live in smaller colonies. If You Go: Spellbound Glowworm and Cave Tours guides you through lesser-known caves in small groups. Rise early to see fiery red hues and the most interesting play of light and shadow on these impossibly smooth and towering dunes. They are some of the world's highest and most photographed. "I always have this feeling of disbelief when I am in Sossusvlei," says local painter Barbara Pirron. "The natural environment is so overwhelming you almost cannot believe it's real." It's a grueling trek to the top of the dunes, but once you reach the wind-sculpted crest of the 1,066-foot Big Daddy, you'll look out over a landscape of countless other ribboned crests. And then comes the adrenaline-rush reward: running down the side, arms flailing, and feeling like a kid again. 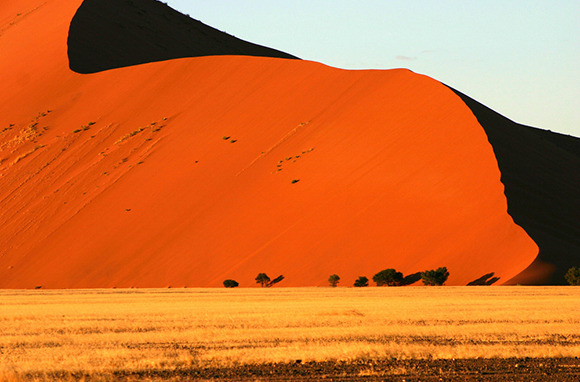 If You Go: Adventure Life's Namibia Adventure trip leads you on hikes along dune ridges. Adventure Women's women-only Namibia Safari trip takes you over the Namib Desert on three scenic flight tours. Both trips include traditional game drives in Etosha National Park and tracking the endangered black rhino on foot.